New bioarchaeological evidence shows that Nubians and Egyptians integrated into a community, and even married, in ancient Sudan, according to new research from a Purdue University anthropologist. 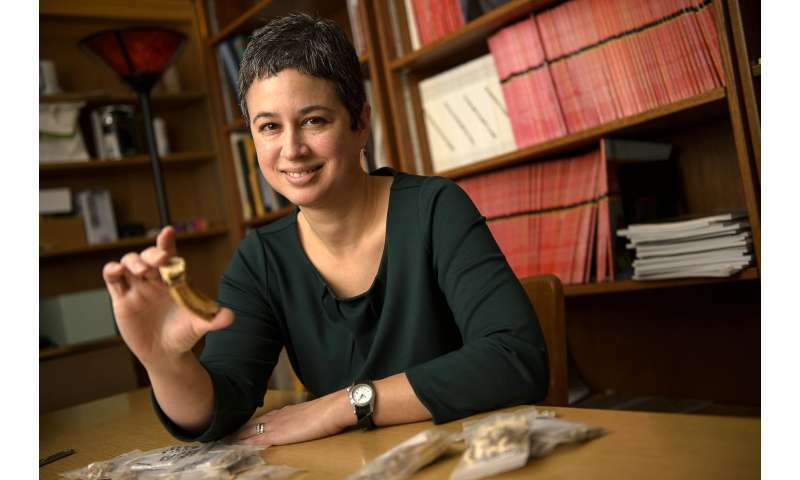 "There are not many archaeological sites that date to this time period, so we have not known what people were doing or what happened to these communities when the Egyptians withdrew," said Michele Buzon, an associate professor of anthropology, who is excavating Nubian burial sites in the Nile River Valley to better understand the relationship between Nubians and Egyptians during the New Kingdom Empire. The findings are published in American Anthropologist, and this work has been funded by the National Science Foundation and the National Geographic Society's Committee for Research and Exploration. Buzon also collaborated with Stuart Tyson Smith from the University of California, Santa Barbara, on this UCSB-Purdue led project. Antonio Simonetti from the University of Notre Dame also is a study co-author. Egyptians colonized the area in 1500 BCE to gain access to trade routes on the Nile River. This is known as the New Kingdom Empire, and most research focuses on the Egyptians and their legacy. "It's been presumed that Nubians absorbed Egyptian cultural features because they had to, but we found cultural entanglement ? that there was a new identity that combined aspects of their Nubian and Egyptian heritages. And based on biological and isotopic features, we believe they were interacting, intermarrying and eventually becoming a community of Egyptians and Nubians," said Buzon, who just returned from the excavation site. During the New Kingdom Period, from about 1400-1050 BCE, Egyptians ruled Tombos in the Nile River Valley's Nubian Desert in the far north of Sudan. In about 1050 BCE, the Egyptians lost power during the Third Intermediate Period. At the end of this period, Nubia gained power again and defeated Egypt to rule as the 25th dynasty. "We now have a sense of what happened when the New Kingdom Empire fell apart, and while there had been assumptions that Nubia didn't function very well without the Egyptian administration, the evidence from our site says otherwise," said Buzon, who has been working at this site since 2000, focusing on the burial features and skeletal health analysis. "We found that Tombos continued to be a prosperous community. We have the continuation of an Egyptian Nubian community that is successful even when Egypt is playing no political role there anymore." Human remains and burial practices from 24 units were analyzed for this study. The tombs, known as tumulus graves, show how the cultures merged. The tombs' physical structure, which are mounded, round graves with stones and a shaft underneath, reflect Nubian culture. "They are Nubian in superstructure, but inside the tombs reflect Egyptian cultural features, such as the way the body is positioned," Buzon said. "Egyptians are buried in an extended position; on their back with their arms and legs extended. Nubians are generally on their side with their arms and legs flexed. We found some that combine a mixture of traditions. For instance, bodies were placed on a wooden bed, a Nubian tradition, and then placed in an Egyptian pose in an Egyptian coffin." Skeletal markers also supported that the two cultures merged. "This community developed over a few hundred years and people living there were the descendants of that community that started with Egyptian immigrants and local Nubians," Buzon said. "They weren't living separately at same site, but living together in the community."